ANUR TOUR company provides the complete package of business travel services: air tickets, train tickets, visa support, transfer, hotel reservation, team building, countryside trips, organizing corporate events in cities of Turkmenistan and Central Asia in whole. Abbreviation of MICE is decode as Meetings, Incentives, Conferences and Exhibitions. In recent years, MICE-sector of the tourism industry shows a rapid growth and intensive development. Organizing corporate events take an important place in the activity of each company. 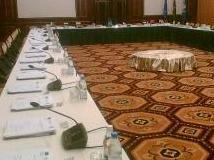 We conduct all preliminary work in organizing the event. We offer various geographic areas and hotels. We make the calculation of alternative options and offer the best one. However, the main feature of our service is the individual consulting for each client. We analyze the statistic of corporate transfer; find the best price proposal for the work with clients. Business people can avail of the business corner, equipped with PCs connected to Internet, and the necessary office appliances - printers, fax and photocopy machines, scanners. Translator's and secretary's services are also available here. 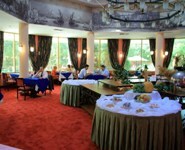 Hotel restaurants and bars offer an impressive assortment of Turkmen, Ottoman, European and international dishes. Smooth service at these spacious venues will leave no one untouched. 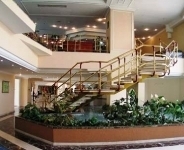 The hotel Ak Altyn Plaza provides possibilities to arrange conferences, seminars and presentations, offering several conference rooms of varied capacity. 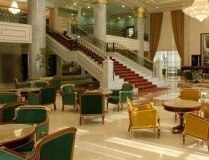 The hotel's business centre allows guests to carry out heir business activities, even while travelling. Hotel guests and visitors can dine at the on-site restaurant, where seasoned chefs offer a wide selection of local and European courses. The restaurant provides an excellent setting for hosting all sots of festivities - private parties, banquettes and corporate celebrations. The lower floors house a conference room, a negotiation room and two meeting rooms, all well-fitted for holding business events, conferences and seminars, and featuring the necessary presentation equipment. 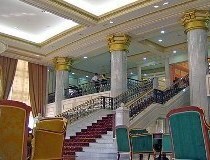 President Hotel offers a variety of on-site dining options, which include - grill restaurant with 100 seats, lobby bar, and panoramic restaurant at the 16th floor with 102 seats. Each decorated in unique style, these venues all share fine cuisine, flawless service, and enjoyable atmosphere. 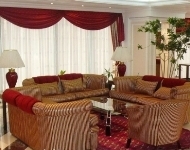 For conducting social functions and receptions, the hotel offers a banquette hall with 250 seats. For more detailed information regarding hotels and MICE tourism in Turkmenistan, please, contact Anur Tour company by e-mail: info@anurtour.com or by phones: (+998 71) 2414290, (+998 90) 1879996. ANUR TOUR staff will help you to select a variant, which suites exactly you, best meets your aims and correspond budget. Events organized by our staff will make you full of pleasant memoirs and wish to work with us again!